If you want to use it for data transfer outside data synchronize, please make sure that you have the right driver for your phone. This means if you want to use iPhone gadgets on Android phone, you will need have on hand with the Android App. Or, you are able to download that from Android App store. This adapter can charge tablet and iPad. You will need to make sure your charging cable can charge tablets. 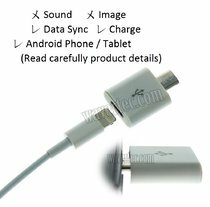 Quite some of cables in the market are not able to charge tablets. If your cable or wall charger came with iPhone, please suppose it cannot be used on iPad nor other tablets.